Tonight’s British Under-21 speedway Final at Coventry’s Brandon Stadium carries a huge incentive for Edinburgh Monarchs talented representative Max Clegg. If Clegg, who celebrated his 18th birthday last week, can fashion a podium spot, then he will advance to the World semi-finals next month, which are being staged in Italy, Slovakia and the Czech Republic. Clegg clinched his place in the Midlands event after winning the semi final stage at Mildenhall nine days ago after piling up 14 points from his five starts. 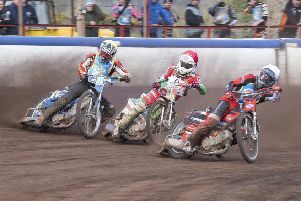 Clegg said: “It’s going to be a huge step up for me from the semi-final and while it would be nice to get on the podium, I’ll be very happy if I finish in the top five, and see no reason why I can’t. It’s more important for me that I gain some experience from riding in a top-class event.